Essays in Celebration of the Centennial of Mises’s major work Theory of Money and Credit. As the Federal Reserve and other central banks run wild, it’s time to reconsider a great work by Ludwig von Mises that is as fresh and relevant today as when it appeared a century ago. The first of Mises’s major works, Theory of Money and Credit was published in 1912 when Mises was barely 30 years old. To commemorate the centennial of this important work, the Mises Institute presents Theory of Money and Fiduciary Media: Essays in Celebration of the Centennial, edited by Jörg Guido Hülsmann. The title of this collection of new essays reflects a more accurate translation of Mises’s original title, Theorie des Geldes und der Umlaufsmittel. This new collection of thirteen original essays comes from a 2012 symposium at the Austrian Scholars Conference in Auburn, Alabama, and provides wide-ranging views and analysis. It features the latest from established Misesian scholars such as Hülsmann and Joseph Salerno along with fresh perspectives from young Misesians such as Philipp Bagus, Malavika Nair, and Matthew McCaffrey. 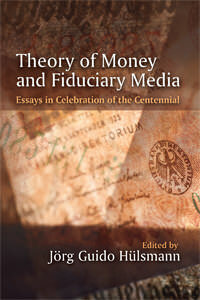 Within Theory of Money and Fiduciary Media: Essays in Celebration of the Centennial, the reader will find new insights on these many topics plus intellectual history and philosophy, while providing the reader with many insights that will no doubt be invaluable in understanding the economic crises of our own time.